Welcome to the Pretty Pink Posh Product Release Blog Hop! This release has a mixture of both whimsical, cute and elegant- there's something for everyone! I am sharing this card using the Peacock Friends and Spring Frame Die!!! I adore this stamp set and the Spring Frame Die is quickly becoming one of my favorite Pretty Pink Posh Dies! I created this card with a light springy color palette in mind. Watch the video here on the Pretty Pink Posh YouTube channel on how I created this card! Here are some pictures, isn't this the cutest peacock ever? Thank you so much for participating and supporting all of the designers fabulous designs. There are 4 $25 gift certificates up for grabs (two winners each day). Winners will be picked randomly along the blog hop. Comments must be left by 11:59 PM PST on 3/13/2019. 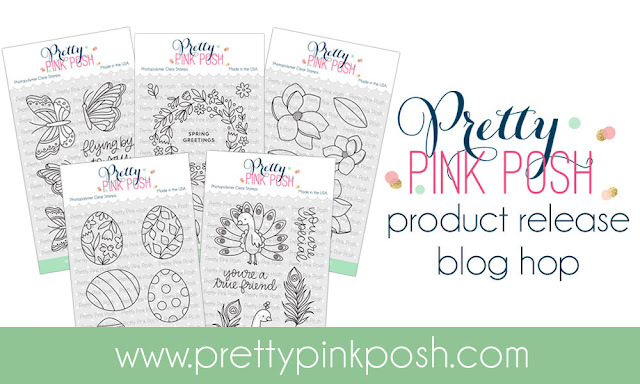 Winners will be announced on the Pretty Pink Posh blog. The peacock is just too adorable. Beautiful card. Very nice. I love all the products and the showcase! Love the peacock stamp set and die. Know I will use it a lot. Lovely card Rina! Thank you. I love how you combined so many different elements to make this gorgeous peacock shaker card!! The soft blending of the colors really is stunning on the peacock! Rina this peacock has captured my heart. The spring frame cover plate looks perfect surrounding your perfectly colored peacock. Thanks for sharing this. Absolutely gorgeous card and the peacock is beautiful. Beautiful design and choice of colors. that's thinking outside the box!! i like the way you colored just part of the frame. neat!! to the leaves is a fun idea. Terrific cards! Your peacock is delightful! Beautiful card. I love how you did the background die brilliant idea and the darling peacock. Love your card and the new release. I WANT THIS PEACOCK sooooo bad! Gorgeous soft colors! Such a pretty card! I can't wait until I can get my hands on that stamp set! The peacock is so pretty. Love the colors. The softer, more muted tones on the peacock are so pretty! I like the added feather on the floral frame, too. Beautiful card! Wow, what an amazing card! I love every detail - the colors, shaker element, layout - just everything! I have to agree, that is the cutest peacock and love how your card. Such a great card! Love all the layering! Oh This is so pretty!!! LOVE! The peacock is adorable! I love that you made it a shaker card! I enjoyed your video of making your beautiful card! Thank you for the inspiration! So pretty! Love that peacock! It is the cutest peacock ever. Thanks so much for sharing your beautiful card! I love that peacock! I also love your color choices for the peacock and the frame. Gorgeous. TFS! Beautiful card. Love the soft colors. What a brilliant way to combine stamps and background die, lovely color scheme. Love the peacock, so cute! SQUEAL!! LOVING the NEW Release and the AMAZING Inspiration!! Such a BEAUTIFUL Design!! THANKS SO MUCH for sharing and have a FABULOUS Weekend!! Gorgeous background die and the peacock is so pretty! The peacock is Adorable and Love how you framed it! Love the peacocks, and love the colors you used. They are so peacock unique and so pretty together! Lovely, elegant card. I love the Peacock Friends set from this wonderful release. Gorgeous coloring! I just love these peacocks! Simply gorgeous! You rocked this release! Such a sweet peacock image...fabulous card. My go to with peacocks is super bright colors, but I really like how you toned it down for your card. It's so soft and delicate. Thanks for sharing! Perfect description of your card: whimsical, cute and elegant. Great design and soft colors! Such a happy little peacock sporting his new spring outfit. I agree, I love the spring frame and peacocks too. What a sweet color combo 😍😍 love the full size shaker!! So pretty! Love the colors you used! And that frame die is lovely! luv that frame with the peacock! Such a beautiful card. Loving that peacock and those colors! This release is super SPECTACULAR and I was so happy to work with the Cool Penguins stamp set! The set comes with the most adorable penguins getting ready to wrap some holiday gifts. I used the Basic Rectangles die set to create a window opening as these penguin friends are going to wrap their gifts together. I also really adore the sentiment that comes with the stamp set. I wanted to keep the coloring super simple on this card and used a few light colored Copic markers. My favorite Copics are the ones that end in 0000 and 000 because I can achieve a light almost watercolor look. Welcome to Sister Stamps Release #29. This release features adorable little animals that can be used to “peek” over elements on your card. I love how you can position your image in such a unique way. As a side note I’m super honored that Jenny named two of the images after my own two babies, Buster and Peanut!!! I decided to use the “Pixie” and “Dixie” images and I decided to get creative with some Heidi Swapp Picturesque Project Life Cards to create the "meadow" background. The elements on the project life cards were perfect as the circle and label details were already on the card. Love how these cards transformed themselves. I am also in love with the Mama Elephant word dies, they are the perfect size and font and added the touch I was looking for. Hope you all enjoy and join me for my next project tomorrow!